In this 30-minute recording Martin Kaipo, (Ngāti Kuri, Te Aupōuri, Te Rarawa) Chief Executive of Otāngarei Trust, shares more than fifteen years’ experience of strengthening whānau aspirations in Northland. 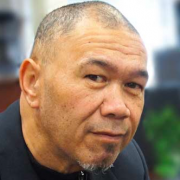 In conversation with Kaye-Maree Dunn (Te Rarawa, Ngā Puhi, Ngāti Mahanga, Ngāi Tamanuhiri and Ngāi Te Rangikoianaake), Martin talks about the Whānau Ora Community Clinic, the Corrections Out of Gate Reintegration for Northland programme, and other whānau-led initiatives in Northland. Martin shares his experiences of his work with Te Hau Awhiowhio o Otāngarei, a large, multi-agency service provider in Northland. He describes how ‘strengthening whānau aspirations’, and ‘empowering people to bring about social change’ looks in his community. This is the place to find research and resources to assit Whānau Ora practice. Launched in November 2012, it was developed by Steering Group members Kataraina Pipi (Ngāti Porou, Ngāti Hine), Fiona Cram (Ngāti Kahungunu) and Nan Wehipeihana (Ngāti Porou). This document provides benchmark principles and standards for undertaking community research, as described by researchers and leaders from community, government and academic sectors in Aotearoa New Zealand. Martin Kaipo – Chief Executive Otāngarei Trust (Ngāti Kuri, Te Aupōuri, Te Rarawa) Martin was a co-founder of Otāngarei Trust and has worked for over twenty years in community development, working with high need at risk youth and their whānau, including a role as Director of three residential facilities. Martin has been involved In a number of community based projects including a Ministry of Justice funded pilot programme, Otāngarei Safer Streets, and advocated for wired fire alarms in all housing NZ homes (which was adopted nationally). More recently, Otāngarei Trust was the lead agency for Whānau Ora collective, Te Hau Awhiowhio O Otāngarei. Martin holds a Post-Grad for MA Māori Development, Bachelor of Social Science, Diploma in Social Science and Certificate in Cultural Supervision.